DETROIT -- Ford Motor Co.’s fourth-quarter adjusted pretax profits fell 19 per cent to $1.7 billion (all figures U.S.) due to higher steel and aluminum prices, as well as adverse currency rates, the automaker said Wednesday. Ford's fourth-quarter operating margin was 3.7 per cent, down two percentage points from a year earlier. Net income swung to a gain of $2.4 billion from a year-earlier loss of $800 million, reflecting a lower effective tax rate and pension re-measurement. The year-earlier loss had been due mainly to accounting changes. Revenue rose 6.7 per cent to $41.3 billion. For the full year, Ford’s 2017 pretax profits fell 19 per cent to $8.4 billion, slicing its operating profit margin to 5 per cent from 6.7 per cent in 2016. Those declines were caused by a $1.2 billion hit in raw materials costs and a $600 million negative impact from Brexit. Net income soared 65 per cent to $7.6 billion, as revenue rose 3.3 per cent to $156.8 billion. Ford shares were up 0.75 per cent in after-hours trading to $12.05 as of 6:46 p.m. Eastern Time. Because Ford Canada is a wholly owned subsidiary of Ford Motor Co., its profits are reported as part of the overall North American financial results for the U.S.-based automaker. However, Ford Canada’s total sales to customers fell 4.9 per cent from a year earlier to 61,894 vehicles in the quarter. The automaker also operates engine plants in Windsor, Ont., an assembly plant in Oakville, Ont., where the redesigned Ford Edge will continue to be assembled, and an r&d facility in Ottawa. Ford's earnings were driven by its North American region, where pretax profits fell 16 per cent to $1.6 billion in the fourth quarter, due to rising commodities and warranty costs plus expenses related to the launch of the Ford Expedition and Lincoln Navigator that Ford attributed to a supplier-related parts shortage that has since been fixed. The warranty costs include an October recall of 1.3 million F-150 and Super Duty pickups to fix faulty side-door latches that cost the automaker $267 million. Revenue in North America rose 4.3 per cent to $24.1 billion. For the full year, pretax profits fell 16 per cent to $7.5 billion in North America, even as revenue edged up 1 per cent to $93.5 billion. As a result, Ford's roughly 54,000 UAW-represented employees will get profit sharing checks of $7,500 on average. That's down from the $9,000 they received last year. In Europe, Ford's pretax profit slid 66 per cent to $56 million in the fourth quarter and tumbled 81 per cent to $234 million for 2017. Most of the full-year drop was attributed to Brexit-related charges, as well as higher commodity and warranty costs. 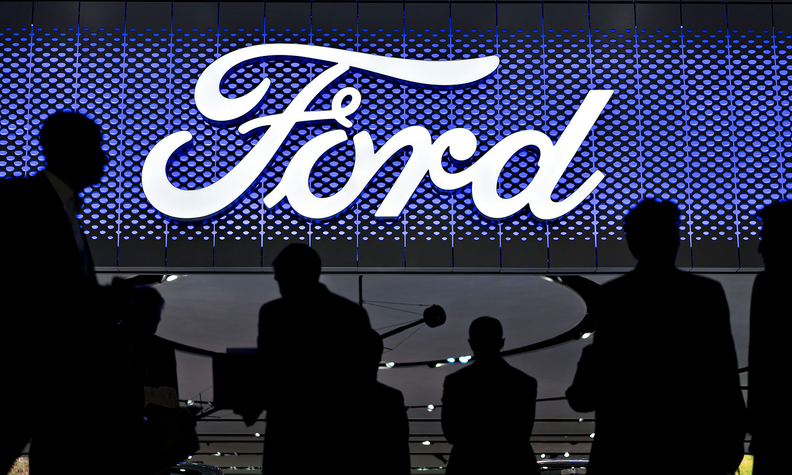 Pretax profits at Ford's Asia Pacific business unit collapsed 98 per cent, to $5 million in the fourth quarter from $284 million a year earlier, largely due to a sales drop in China. For the full year, pretax profits there slipped 11 per cent to $561 million. Ford Motor Credit Corp.'s fourth-quarter pretax profit jumped 53 per cent to $610 million, and its full-year pretax earnings rose 23 per cent to $2.3 billion. Ford last week lowered its 2018 forecast for what CEO Jim Hackett characterized as a "bad year." Its per-share guidance for 2018 translates to earnings of $8 billion to $9.2 billion, according to investment firm Barclays Capital, down from an initial forecast of $9.9 billion. Shanks, speaking last week, said the company will face about $1.6 billion in increased commodities costs, including steel and aluminum. Shanks said most of that impact will come from rising steel costs, and that aluminum represents just 25 per cent of that negative impact. Ford’s crosstown rivals, including General Motors and Fiat Chrysler, have not highlighted commodities as a financial concern. Adding to the financial woes are the company's mobility investments, which were about a $300 million drag on earnings in 2017, the first year in which they've been broken out separately. Executives said mobility losses would be larger in 2018. Shanks said that Ford isn’t as fit as its peers, and that is stopping it from achieving its desired profit margins of around 8 per cent. Executives have said that Ford has started to implement business practices that should begin to bear fruit in 2019 and beyond, focused around Hackett’s mantra of “smart vehicles for a smart world.” Those include $14 billion in costs cuts, simplifying orderable products, and tailoring its model lineup to higher-margin segments for different parts of the world.